So, I know that this one is a little different than what I usually review because it's not speculative fiction, but AHHH PONIES!!! 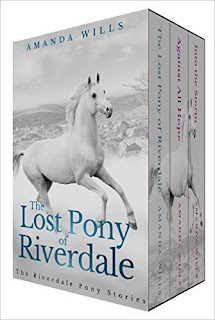 The Lost Pony of Riverdale by Amanda Wills made my 11-year-old heart squeal with joy. This sweet middle grade novel tackles a few big issues like depression and anger, brought on by the death of Poppy's mother years back and the new family's sudden move to the country with Poppy's stepmother of several years. Poppy's actions and understanding of the world around her are spot on for her age, and she matures by the end, no longer seeing her kind stepmother as the enemy. Her six-year-old brother is a great supporting character who adds adventure the way only a six-year-old can. The setting feels real-to-life, as does the care required for such a large animal. 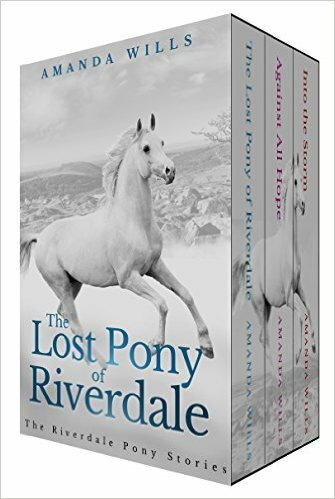 The Lost Pony of Riverdale is a story of underdogs, disappointment, and moving on from tragedy through love. Pick it up here on [ Amazon ] to start reading immediately. There are several books in the series (Yay!) and you can get the first three as a bundle on [ Amazon ]. Thank you so much for such a lovely review, Michelle. I channel my 11-year-old self when I write the Riverdale books so I am so glad the book made your 11-year-old heart squeal with joy! It's really great to get such positive feedback. Thank you!